High strength, impact resistant thermoplastic. Easy open guard permits relamping without removing guard. Tempered glass lens with metal safety grill. All weather 3 foot, 18/3 SJTW cord with molded plug. Spare bulb included. Compact folding LED work light with bungee hooks. 2 high powered LEDs generate up to 180 lumens. 3-way integrated switch: both panels on/single panel on and off. Hinge adjusts up to 270 degrees. Durable polycarbonate lenses. Bungee hooking mechanism attaches to hard to hang places. Extendable bungee hooks stow inside each panel for easy storage. Up to 4.5 hour battery life with 3 AA alkaline batteries, included. Adjustable magnetic mounting bracket and motion sensor. Mode switch chooses between manual or motion sensor operation. Detaches from its bracket for hand-held use as a flashlight. 50 lumens, LEDs last 100,000 hours. Uses 3 AA batteries, (not included). Includes double-stick tape, screws and drywall anchors. 0.35 lb., 13"L x 1"D x 6"W. Sit on a base or held or hung by an integrated handle. Off and on manually or with a motion sensor for automatic operation. 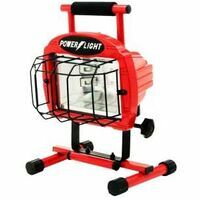 It functions as a night light and task light and is easily portable as a lantern for power outages, emergencies or camping trips. LEDs last 100,000 hours. Uses 4 AAA batteries, (not included). 30 lumen. 0.35 lb., 10" length x 2.5" depth x 6" width. Cooler bulb, safer to touch. Bulb included, lasts up to 7 years. Hang hook. 6 foot 18/2 SJT cord. UL listed. Similar amount of light to a 75 watt incandescent bulb but with daylight color (7000 Kelvin). Instant on switch. Durable plastic construction with polycarbonate lens. Cushioned grip. Swivel hook rotates 360 degrees. 15', 18 gauge cord. 120 volts. CCI Work Light, Portable, Series: Pro, 600 W, Halogen Lamp, 300 W Lamp, 3 Lamps, 10800 lumens, 18/3 AWG Cord, 5 ft Cord Length, 8.2 in Overall Length, 5-1/2 in Overall Width, 12-1/2 in Overall Height, Die Cast Metal, Powder Coated, Red, cUL, UL Listed Cool burning fluorescent light features flashlight type end cap with one outlet for convenient hook-up of an additional tool, the ballast and the on/off switch in the handle. 16/3 SJT, 13 watt, 13 amp, 120 volt. 15-1/8" total length, uses 13-watt type PL bulb (included). UL and C-UL listed. Sleeved. Floor stand. 40" tripod. 6', 16/3 SJW cord. UL listed. CCI Twin Head Work Light, 2-in-1, Adjustable, Series: Contractor, 120 V, 1000 W, Halogen Lamp, 500 W Lamp, 2 Lamps, Corded Electric Power, 20000 lumens, 18/3 AWG Cord, 5 ft Cord Length, NEMA 5-15P Enclosure, 63 in Overall Height, Die Cast Metal, Powder Coated, Orange, Includes: (2) Weatherproof Switch, cUL, UL Listed Durable polycarbonate lens. Cushioned grip. Swivel hook rotates 360 degrees. AC adapter for household charging, DC adapter for car charging. Magnetic clamp. End of light doubles as a spotlight. LED work light. Stays cool to the touch. 5x more energy efficient than Halogen lights. Sealed die-cast aluminum housing. Power cord with grounded plug. Long lasting super bright LEDs never need replacing. Adjustable tilt: 30 degrees down and 90 degrees up. Metal carrying handle. Sealed on/off switch. Indoor/outdoor approved. Impact resistant glass lens. 120V, 60 Hz, 5000K bright white. Adjustable 6' tripod. Two 500 watt Halogen fixtures. Tempered glass lens with metal safety grill. All weather cord with polarized plug. Spare bulb included. 18/3 SJTW 6 foot cord. UL listed. Foldable rechargeable LED work light. High-capacity rechargeable battery, 7.4V Lithium-ion. Runs for 2 hours on high brightness and holds its charge for up to 18 months in storage. Light stays cool to the touch. Long lasting super bright LEDs never need replacing. 4 modes: high, medium, low and flashing. USB output for charging other portable devices. Head tilts 360 degrees. Indoor/outdoor approved. Includes 120V AC wall charger 12V DC car charger. 5000K bright white. 3 hours recharge time. Stays cool to the touch. 5x more energy efficient than Halogen lights. Sealed die-cast aluminum housing. 9? power cord with grounded plug. Long lasting super bright LEDs never need replacing. Adjustable tilt: 30 degrees down and 90 degrees up. Sealed on/off switch on each light. Impact resistant glass lens. Metal base. Quick-release system for detaching lights from tripod. 120V, 60 Hz, 5000K bright white. Constructed with molded lamp sockets and non-metallic lamp guards. Each 150 watt light is 10' apart. 125 volt. Boxed. Foldable rechargeable LED work light. High-capacity rechargeable battery, 7.4V Lithium-ion. Runs for 2 hours on high brightness and holds its charge for up to 18 months in storage. Light stays cool to the touch. Long lasting super bright LEDs never need replacing. 4 modes: high, medium, low and flashing. USB output for charging other portable devices. Head tilts 360 degrees. Indoor/outdoor approved. Includes 120V AC wall charger 12V DC car charger. 5000K bright white. 3 hours recharge time. LED work light. Stays cool to the touch. 5x more energy efficient than Halogen lights. Sealed die-cast aluminum housing. Power cord with grounded plug. Long lasting super bright LEDs never need replacing. Adjustable tilt: 30 degrees down and 90 degrees up. Metal carrying handle. Sealed on/off switch. Indoor/outdoor approved. Impact resistant glass lens. 120V, 60 Hz, 5000K bright white. LED work light. Stays cool to the touch. 5x more energy efficient than Halogen lights. Sealed die-cast aluminum housing. Power cord with grounded plug. Long lasting super bright LEDs never need replacing. Adjustable tilt: 30 degrees down and 90 degrees up. Metal carrying handle. Sealed on/off switch. Indoor/outdoor approved. Impact resistant glass lens. 120V, 60 Hz, 5000K bright white. LED String Lights. Five (5) high intensity LED light heads (1000 lumens each). Sealed die-cast aluminum housing. 9? power cord with grounded plug. Long lasting super bright LEDs never need replacing. Adjustable tilt: 30 degrees down and 90 degrees up. Metal carrying handle. Sealed on/off switch on each light. Impact resistant glass lens. Metal base with rubber feet. Quick-release system for detaching lights from tripod. 120V, 60 Hz, 5000K bright white. 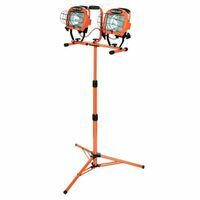 Dual-head LED work light with tripod. Stays cool to the touch. 5x more energy efficient than Halogen lights. Sealed die-cast aluminum housing. 9? power cord with grounded plug. Long lasting super bright LEDs never need replacing. Adjustable tilt: 30 degrees down and 90 degrees up. Sealed on/off switch on each light. Indoor/outdoor approved. Impact resistant glass lens. Metal base. Quick-release system for detaching lights from tripod. 120V, 60 Hz, 5000K bright white. Dual-head LED work light with tripod. Stays cool to the touch. 5x more energy efficient than Halogen lights. Sealed die-cast aluminum housing. 9? power cord with grounded plug. Long lasting super bright LEDs never need replacing. Adjustable tilt: 30 degrees down and 90 degrees up. Sealed on/off switch on each light. Indoor/outdoor approved. Impact resistant glass lens. Metal base. Quick-release system for detaching lights from tripod. 120V, 60 Hz, 5000K bright white.